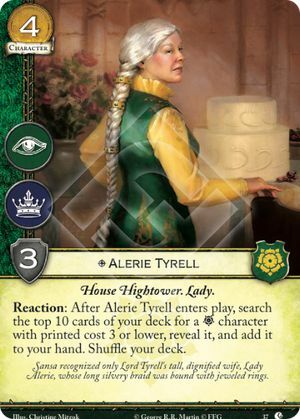 Reaction: After Alerie Tyrell enters play, search the top 10 cards of your deck for a character with printed cost 3 or lower, reveal it, and add it to your hand. Shuffle your deck. Sansa recognized only Lord Tyrell's tall dignified wife, Lady Alerie, whose long silvery braid was bound with jeweled rings. Lions of Casterly Rock #37.